If you're local to Ipswich, MA or to the North Shore of Massachusetts, chances are quite good that you've heard of the Crane family. In 1910, Richard T. Crane, Jr. purchased a property called Castle Hill, featuring sweeping views of the Atlantic Ocean and surrounded by wildlife. The Cranes hired noted architect David Adler in 1928 to build a 59-room Stuart-style mansion, which is meticulously maintained by the Trustees of the Reservations. The Trustees asked Betsy to create a unique piece of jewelry exclusively for the Crane Estate. As a resident of Ipswich, Betsy was honored to be asked, and thrilled that there were no set guidelines! After touring the grounds extensively, she found herself inspired by a "fanlight" featured in the doorways of the Rotunda in the Mansion. A fanlight - also called a sunburst light - is a semi-circular window set over a doorway. 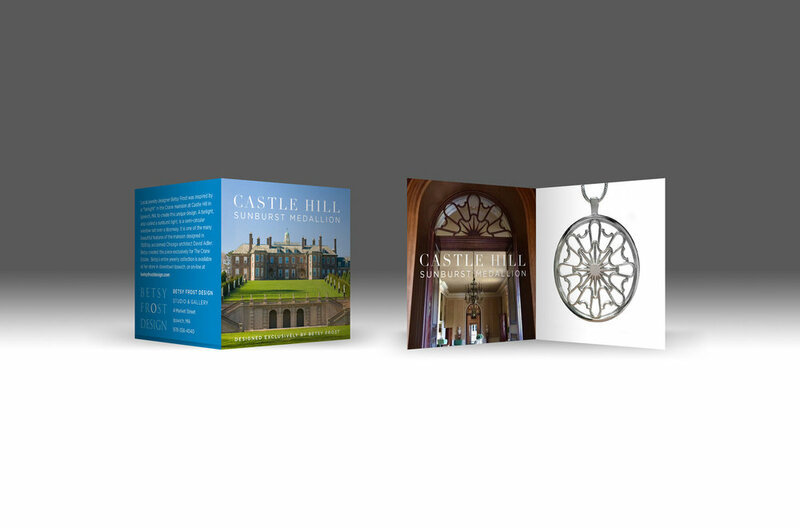 Its unique architectural design stayed with Betsy and became the Castle Hill Sunburst Medallion. The Castle Hill Sunburst Medallion is available in solid sterling silver or rhodium plate, with your choice of a snake chain, black leather cord, or blue silk cord. It comes with a beautifully-designed card detailing the story behind the piece - making it a fantastic gift!